After trauma and/or surgery of the radius, ulna, Distal Radial-Ulnar joint (DRUJ), proximal radial-ulnar joint and/or TFCC structures, and/or for certain elbow pathologies, it may be important to prevent full active forearm rotation so that the injured tissues and structures can heal without overstretching or shortening of tissue length. Patients with injuries such as TFCC tears, Galeazzi fracture dislocations, DRUJ fractures and dislocations, and ulnar abutment injuries are typically treated with a cast, a Sugar Tong orthosis or the Muenster orthosis to immobilize the forearm. The Muenster and Sugar Tong orthoses allow for limited active flexion and extension of the elbow, but prevent full forearm rotation, and provide stabilization of the radial-ulnar joint and immobilization of the DRUJ. The Sugar Tong orthosis is a long thermoplastic rectangle positioned from the dorsal metacarpal heads around the posterior elbow capturing the medial and lateral epicondyles, to the volar palm. The Muenster orthosis is a wrist orthosis with long proximal extensions to converge on the medial and lateral epicondyles at the distal humerus. A study of the degree to which these orthoses actually limit forearm motion indicated that while the Sugar Tong orthosis is more effective at preventing forearm pronation than the Muenster orthosis, neither orthosis completely limits full forearm rotation (Slaughter et al, 2010). Participants in the study received sensory feedback that they were reaching limitations in forearm range of motion, but were still able to rotate through the forearm arc of motion. However, these participants had no forearm pathologies. Patients experiencing painful forearm motion would be instructed to limit full rotation of their forearm: pain, swelling and post- operative bandages would further limit motion. Muenster Orthosis: An elastic based coated material is highly recommended for the Muenster Orthosis. Orfit NS, Aquafit NS (Orfit Natural NS) and Orfit Colors NS in 3.2mm (1/8”) all work very well for this design. The non-stick coating of these products allows the fabricator the ability to pinch the thermoplastic material together at the posterior elbow and on the ulnar border, allowing both hands to position the wrist in slight extension and the forearm in the a neutral posture. 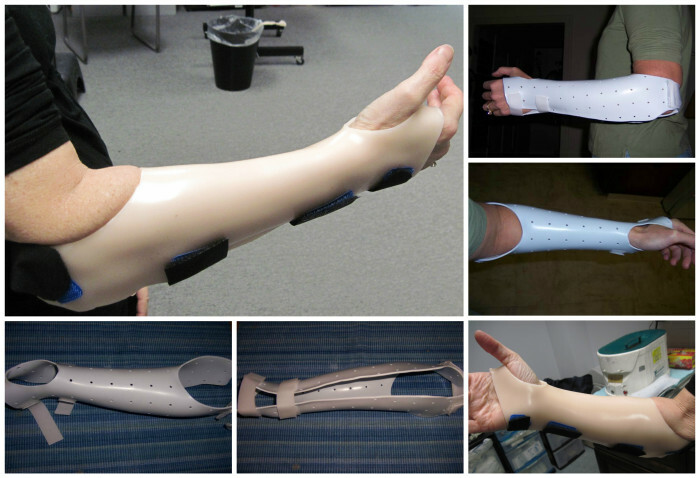 A more rigid material can also be used: see product recommendations for the Sugar Tong Orthosis. Sugar Tong Orthosis: This orthosis is best made from a long rectangular strip of a more rigid material: Orfibrace, Orfit Eco, or Orfit Eco Black NS in 3.2 mm (1/8″) are recommended. The materials that we recommend for the Muenster Orthosis would also work well for the Sugar Tong Orthosis.. The patient should be standing or seated with the elbow flexed to 90° and the forearm positioned in neutral to fabricate these orthoses. You will need full access to the posterior elbow, epicondyles and wrist for best fabrication technique. These orthoses should be worn full time immediately after surgery of the involved structures. The patient would be instructed in gentle elbow range of motion exercises. When patients are required to wear their orthoses for long duration during day and night, it is always helpful to consider the size of the patient’s extremity, the specifics of the diagnosis and the weight of the selected material for the orthosis. Orfit offers Orfilight, an extremely lightweight material that might be appropriate for many of your patients, regardless of the specific diagnosis.